Saturday is my favourite day of the week. Steve and I have a weekly date morning where we go to the Farmer’s Market and then out to the best cafe in…well – maybe in the whole world. 🙂 We also do short errands on Saturday mornings if we have them, such as going to the thrift store or other quick stops. Today, we went to the market, out for coffee and then to the natural food store and my favourite baking supply shop. Later on, we dropped by the grocery store. 1 container of sour cream – Guess what’s in this? Just cream, bacterial culture. It is actually real cultured sour cream, not something that has been chemically ‘soured’. 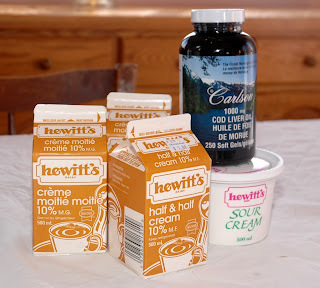 a nice big bottle of cod liver oil capsules – this is the only supplement we take on any regular basis. I particularly like it in the winter when we are indoors a lot and aren’t eating as wide a variety of foods as we are in the summer. I like it because it is a food supplement, not a faked up one. 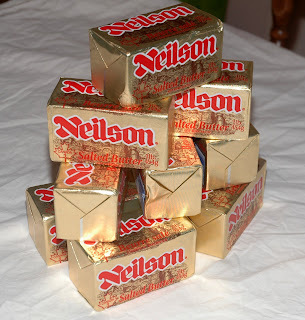 Then, we stopped by my favourite baking supply store. It was a somewhat unsuccessful trip, as I was in need of some wheat berries and they didn’t have any large bags. I need to remember to call ahead next time. I did put some on order, though. I possibly bought some chocolate easter eggs, too, but I can’t take a picture of them because someone ate them on the way home. 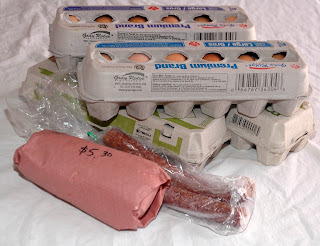 I thought it might be fun to chronicle the foods our family buys for a week. This doesn’t reflect what we actually eat for a week, since I stock up when I shop and we also eat lots of food that I have canned or frozen. 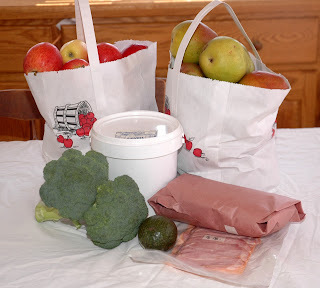 So…without further ado, our first stop is Whole Circle Farm, where I picked up a few things from the farm store as well as our natural foods co-op order. 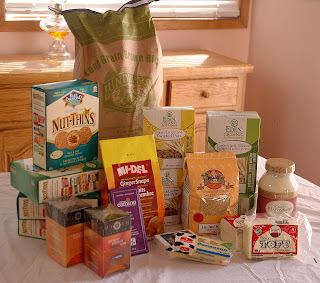 We order from Ontario Natural Foods Co-operative once a month. I have been a member of an ONFC buying club for about 14 years, now. 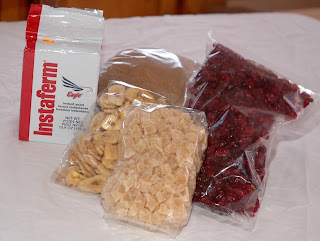 My orders vary widely so that some months I get lots of staples, like dried beans and bulk grains. Sometimes, like this month, there are more convenience foods such as crackers and pastas. (I always order Steve and I a nice chocolate-y treat, too.) While our philosophy is to eat whole foods, we aren’t perfect and we do what we can to try to buy fairly high quality when we do get non-whole foods. I think one important thing in our view of food is that while we eat convenience foods sometimes, like crackers and pasta, we don’t convince ourselves that these are as nutritious as whole foods. It is simply not possible to outsmart God. Only He knows why he put foods together the way He did and we can’t begin to be smart enough to take them apart, rearrange them and expect to get them better than (or even as good as) He did. What was in my order this month? I thought you might also enjoy this picture, taken by my oldest daughter, of the happy chickens at Whole Circle. 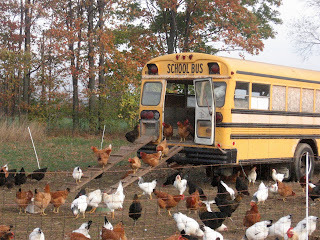 I think it is hilarious how Johann and Maggie, the farmers, use a school bus for a chicken house!! Johann just moves the bus when he wants the chickens to have fresh pasture. Photo Courtesy of Brianne G.
I’ve been trying to decide what to do with it and today, I cast on a very cool and very easy project. 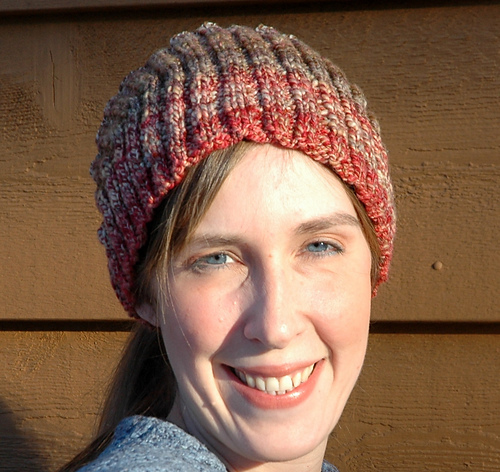 Calorimetry is an online freebie pattern from Knitty for a hat-substitute that will work well when you are wearing your hair up in a ponytail or a big barrette. I estimate the entire project took me about 1 1/2 hours of knitting time. It was a breeze. 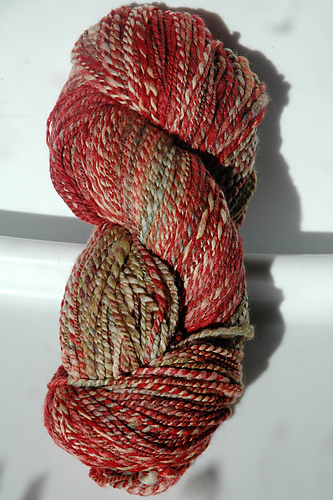 This would be a great project for adults or young knitters. 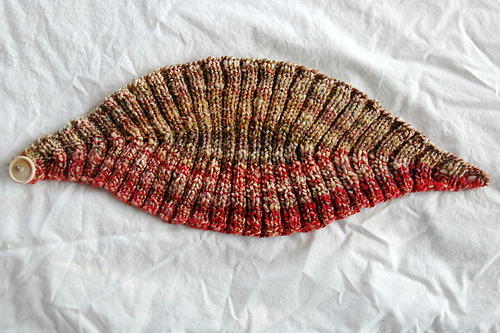 Please watch the size, as a lot of knitters have complained that it is a bit loose. I used 108 stitches for mine and I like the fit. You can really use just about any stitch count that is a multiple of 8. Sorry this is cutting off on the side. You can click the picture to see the whole thing. As always, I’d love to hear if you make one!! I learned the word pathetic when I was in grade 5 and my friend, Maureen, learned it – and used it – very often. 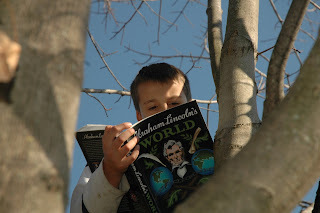 We were in the gifted class together, so we found, errrrr…odd ways to amuse ourselves. In case you don’t actually know the word, pathetic, I thought I would give you a picture which defines it quite well. Here is baby guy in a photo taken a few days ago. Sigh. These two carrots are best-buds. I just love the treasures we find in our bi-weekly CSA share. (During the summer, we collect a share every week.) The farm where we get our CSA is both organic and bio-dynamic. This means we get real-looking food, as opposed to perfect, uniform produce. As an adult, used to regular grocery-store food, it has taken me awhile to appreciate the beauty and ‘realness’ of food that is not factory-farmed. Our children, however, raised on just such food seem to think the more interesting our food looks, the better! When the kids come along to pick up our weekly share, they delight in searching out the carrots with 4 ends or the squash that is bent back around on itself. The above picture is one very cool finding from this week. 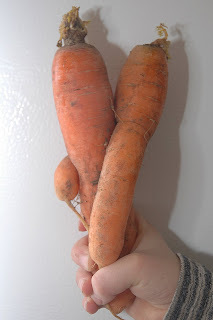 We weren’t there to pick up the share this week, so my mom chose out these two carrots, who are obviously very closely connected, knowing our children delight in just this type of thing. I decided to have them finish out their life in the same soup. Oddly enough, the one carrot was just hugging the other one. They came apart fairly easily. I encourage you, particularly this summer when the fresh, local foods start to be more prolific, to find the joy in ‘oddball’ fruits and veggies that have been selected and grown for their nutritional value and their taste, as opposed to their ability to travel well and be uniform. It is funny that we have come to associate these latter qualities with ‘goodness’, while the actual value disappears from our food. Well, I’m off to eat some split pea soup with fresh bread! I am reading an excellent book right now called, That’s My Son: How moms can influence boys to become men of character by Rick Johnson. I am finding it to be both readable and enlightening. The author communicates in a very real way that I find to be helpful in understanding my sons and my husband. I highly recommend it to anyone with boys. Even if you don’t have boys, the book is terrific for helping you understand the males in your life and to help your daughters do the same. A particular chapter that I enjoyed was the one on communicating with boys. In order to be really inspired (to make it your own!) you will definitely need the context of the author’s original words and his personal anecdotes. However, I would like to share a few of his tips with you. Tell a story, particularly one based on personal experience, to illustrate your point. Listen for key words in what your son says. Usually, they will centre around primary emotions — words such as afraid, hurt, Wow! Be comfortable with silences. Boys often need time to think and process. For deep conversations, do something physical while you talk. Shooting hoops or going for a walk are a couple of ideas. Many males dread, and feel intimidated by, conversations that involve sitting down with long times of direct eye contact. I remember Sally Clarkson saying that her boys often open up the most when she is scratching their backs. When they are not feeling threatened, it is much easier for them to share. Let the boy have the last word whenever possible. Sadly, men get used to being overrun by females who, in general, have superior verbal communication skills. It isn’t that women are truly right more often, but many times they can make more persuasive arguements and end up leaving the men in their lives apologizing when they aren’t really wrong to begin with. In the case of discussions with your son, let him leave the conversation feeling like he is a respected member of the family team. Expect to have to bring it up again. Often boys don’t ‘get it’ the first time around. One more thing that was helpful to me in my relationship with the men in my life was the author’s sharing of the concepts of love and respect. He said that men value respect so much that for many of them, it is more important than being loved. Contrast that to the way the average woman feels! Showing our husbands and our sons that we are proud of them, and making sure to never hit below the belt will go a long way to helping them communicate with us. I am really missing blogging! 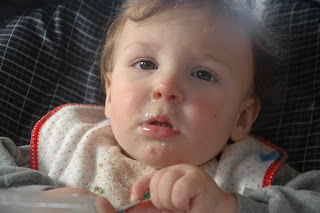 The truth is that we have been sick constantly for several weeks. It is never anything horrible, but just constanly one person after another with some kind of low-grade sickness. I couldn’t believe it when another child woke me up in the middle of the night last night with the sickies. I think it is due to my bragging that our family is almost never sick (which is true). Anyway, many of us are at least semi-well and I was feeling inspired to serve something different for breakfast. I baked bread yesterday, so we had lots of that to work with. 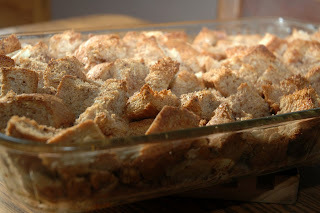 Being too lazy to make French Toast, I decided on a French Toast Strata. I made this up, being inspired from another recipe. Preheat oven to 350 F. Grease a 9 x 13″ pan. Cube bread and put half of the cubes into the pan. Sprinkle with the sliced apples and chopped nuts. Top with remaining bread cubes. Combine eggs, milk, salt and cinnamon and drizzle slowly over bread, trying to cover all the cubes. Take the fork you used to mix the eggs/milk and squish down the cubes a little to soak up some more of the liquid. Place in oven for about 35 mins. Serve with maple syrup.